I get this question all the time from well-meaning friends and concerned neighbors who see pictures of my son in a camp for kids with cancer and chronic medical conditions and wonder if there is something I am not telling them about my son’s condition. It’s hard to explain to them what going to Camp Simcha has done for my child and our family. It’s one of those things that you need to experience to understand, and trust me, no one ever wants to pay the steep entrance ticket to experience Camp Simcha. I didn’t want to send my son to Simcha. I had conversations with different people in Chai Lifeline after we received the invitation, and I was sure that I was going to be putting my son in a situation he didn’t belong. I imagined a camp full of sick kids in treatment for cancer with my son, the kid recovering from a craniotomy to remove a tumor that wasn’t going to kill him. I tried to look at his surgery like an appendectomy. We removed it. He recovered. Carry on. But that first year after his surgery proved that philosophy wrong and unrealistic. School, which had been easy for him, was suddenly a nightmare. Everything was difficult. The medications he was taking affected his days and nights and we were constantly taking him back to the doctors, sending him into the hospital for overnight tests, and waiting in trepidation for whatever the next MRI would reveal. I missed so many days of work and was so distracted from my job that I was sometimes surprised when I saw a paycheck clear in my account. I was changed. I knew that no matter what, from the day of the surgery and onward, nothing would ever be the same. The invisible safety net that I had thought always surrounded my family had been snatched away, and so, even as my son improved, the worries never abated. I would walk to his room in the morning and hold my breath before opening the door, bracing myself in case I couldn’t wake him. Fearing that maybe he had suffered a seizure in the night. Scared constantly by all the what-ifs. And with those fatalistic and scary thoughts came the equally crippling fear that maybe I was crazy. Maybe I was making things larger than they actually were. I knew of kids in far worse situations. Kids who were not going to camp. Kids who spent months in the hospital to his sporadic nights. It was difficult to balance – the happiness at his health and the pain of others. As he grew stronger and healthier, my guilt in that health grew. I was embarrassed by my worries, ashamed at my good fortune. And every time I tried to take stock, get grounded, and just close that door – go back to that time before my world changed – I couldn’t. With every good report, I found myself waiting, always waiting, for whatever bad news I felt would come next– news that I almost felt I deserved. Perhaps he felt that. My son, who was the focus of my constant hovering and questions, who sensed that when I kissed him goodnight, I cried in the shower later that evening. That I measured out my days since his surgery in moments and pieces instead of long years, always believing in the back of my mind that we were living on borrowed time. We are so hard wired to be normal. To be just like everyone else. For us, putting on that face of normalcy conflicted with the very real underlying feelings that we were so far from that, and would probably always be, try as we may to remedy it. In many ways, it was isolating. We existed between two worlds. The world of pediatric brain tumors where we were the best case scenario and couldn’t express our worries and fears to our new friends who had it so much worse, and the friendly neighborhood world of skinned knees and strep throat where there was no one who could fathom what our day to day was like. Somewhere in that mix of emotions and stress and tears and relief, was my son. Struggling with his own fears, his own experience, and his own understanding that no matter how much I downplayed the next MRI, he knew what was at stake. So then Camp Simcha came along. We watched him change that first year in camp, becoming more confident than we had ever seen. Mainly, and in his own words, he said he goes there and feels “normal,” though ironically, if you saw him during the year, you would never imagine that he thinks otherwise. My friends and neighbors would never believe it. But then, they aren’t witness to the types of conversations he has with his counselors. They don’t realize that his closest friends are much older than him. They can’t understand that he went into that surgery as a child, and emerged more mature than some of the adults I know and is light years beyond the typical 11-year-old in terms of his experiences, his thoughts, and his ability to empathize with others. I carry tremendous guilt with me when it comes to my son. Not just the survival guilt which any therapist would identify from a mile away, but guilt that I didn’t do enough for him when we missed all the signs leading up to the discovery of this tumor, and guilt that I overcompensate now, being hyper-vigilant so that I won’t miss anything again. And I have guilt that he goes to Camp Simcha despite knowing how crucial it has been in his healing. There’s guilt in the pictures I see of him smiling, guilt that he can smile, and guilt that I can’t send him away to a regular camp – not yet, not now – and guilt that he is getting better. 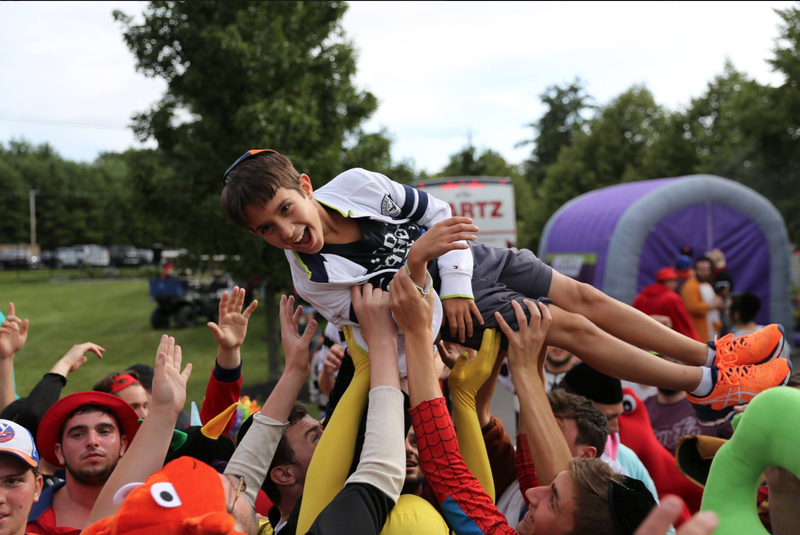 Why do I send my son to Camp Simcha? Because as crushing as my insecurities, my guilt, sometimes become, I can’t let my son be a victim of it. Camp Simcha gives my son two weeks of joy and gives us two weeks to remember that he deserves it. That his days that I carefully measure in appointments and symptoms are far better spent in shaving cream fights and late-night dodgeball games. Much better spent on hammocks between trees, on boats, on ziplines, and on the shoulders of magical counselors who love him as fiercely as we do. Much better spent as an actual 11-year-old. Somewhere between closing the metaphorical door of any traumatic situation and getting sucked into the constant vortex of pain and victimhood, there’s a middle place of relative contentment. Of just understanding that it is what it is. You can’t keep defaulting to the worst case scenario or you’ll go crazy but you also can’t ever really close the door. I’m not sure if I found that sweet spot yet, but maybe I’m getting a little closer to it. Initially, sending him to Simcha made me think that I was placing my son squarely in the shadow of my fears and ensuring that he would forever be carrying the victim card. Instead, it was the complete opposite. It freed him of it. Because as much as I thought I knew what Camp Simcha was about, I realized that first year that I really knew nothing. And as much as my friends who ask me why I send my son there think they know what it’s about, they can’t possibly ever understand. And hopefully, they never will.